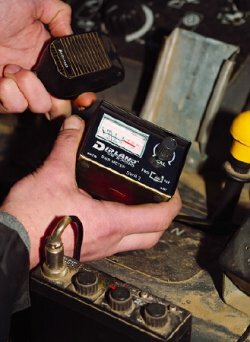 Fitting a CB Radio set-up into a piece of farm machinery is usually fairly straightfoward. We give lots of info below and on the various pages of this site, certainly what you will need to know to install it successfully, but if you have any questions just ring - 01306-881137. The main point is to get the aerial right - this has the most effect on how well your system works, so its worth spending a bit of time doing it well. The acid test is the SWR reading, put simply this is the amount of power thats being "reflected" back from the aerial instead of being transmitted, and this energy has only one place to go - back into the set. Obviously you are wanting to transmit as much of your power as possible, so you're looking for a low reading - a high reading means that not only are you not transmitting as far as you should, but you run the risk of damaging the set. You find out what the SWR reading is with an SWR meter - a cheap and easy to use bit of kit, which allows you to see how well your aerial is tuned in. Aerials are affected by objects that are close to them, especially metal objects, so it's no good running the aerial up the side of your vertical exhaust or side of the cab - this will make their SWR reading bad. Following the instructions on our SWR Information page, you should be able to check and tune your aerial if necessary (most aerials just need a simple check rather than actualy adjusting). The ground connection also has a major effect on the SWR performance, so it might be an idea to read our Ground Plane Information Page. We touch on the subject of connecting the CB to power in our interference pages as how you connect the set can make a difference in terms of how much interference you might suffer. Apart from the few 24v/12v CB's made now, all the CB's made need a connection to 12-14v supply - if you have a 24v machine, you should use a dropper to give a 12v-ish supply. With an ordinary 12v system, it's best to take power straight from the battery to feed the CB. this is not because the CB will draw a large amount of power - it won't - a very small amount actually (2 amps or so), but taking power direct from the battery will allow you to use the CB irrespective of what the engine/ignition is doing, and you will minimise the amount of interference. If you need to extend the power lead, we sell red & black power cable by the meter. If you do this, you should use a fuse in your lead as close to the battery as possible. Luckily, most agricultural machines and vehicles have plenty of space around, so you should find many places where a CB can be put. With reference to our interference problems page where we look at how it's a good idea to offer the set up around the places you are thinking of fitting it, just to make sure you are not putting it right next to some (hidden) interference-giving device. All our sets come complete with a bracket, self tapping screws to fit the bracket, a little screw-on mic holder and some side screws to hold the set in the bracket. These can usually be undone to let you take the set off the bracket, allowing you to remove it for security (although if you want to remove & fit regularly, it might pay to get a slide mount). If you have a secondhand set and need brackets etc, we sell quite a few rig brackets & accessories and microphone holders to allow you to fit your set properly. Chances are that if you have a second hand CB, the power lead will be chopped about a bit - these are only £2 for most rigs for a brand new one - see our CB rig power leads. A popular mounting place for a CB is in the roof of the cab, although if you have air-con units there, these can be a source of the dreaded interference! This also keeps the mic lead out of the way of your selectors and controls, and usually means the downward facing speaker is pointing right at you.